This was some dark magic. 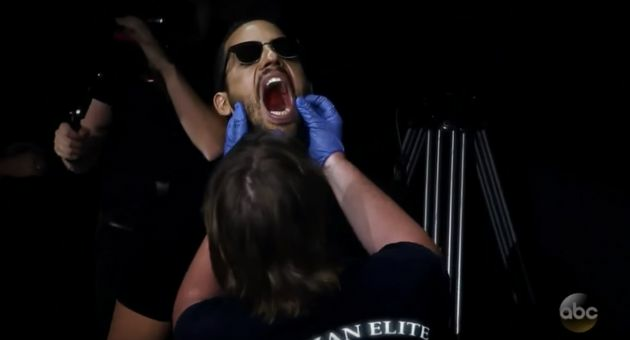 World-renowned magician and endurance artist David Blaine was injured when an attempt to catch a bullet in his mouth went painfully awry, as seen in a November video that’s now going viral. The 43-year-old was wearing a mouthguard when a metal cup that was meant to catch the bullet between his lips slipped, The Wrap reported. The bullet, which Blaine fired himself using a string, ended up shattering the protective guard, and Blaine sustained a cut in his throat in front of a live audience at Las Vegas’ MGM Grand Garden Arena. He was taken away in an ambulance but seemed to be in good spirits. The death-defying stunt first aired in November as part of Blaine’s ABC special “Beyond Magic.” It’s going viral anew this week. 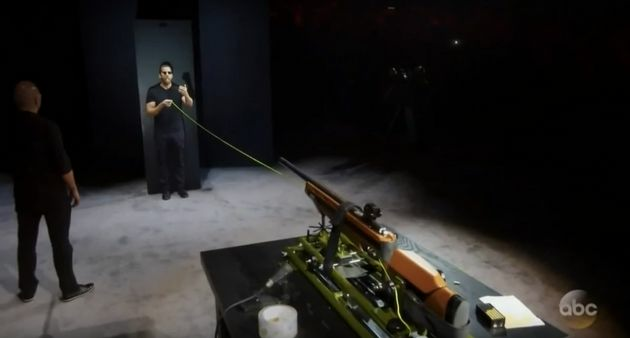 Blaine fired the shot himself by pulling a string that was connected to a gun. “When the bullet struck the cup, there was a high-pitched ringing in my ear and I felt an impact on the back of my throat,” Blaine says in the video. Medical personnel quickly inspected Blaine after his stunt went awry. Video later shows him at University Medical Center of Southern Nevada, where one of his friends who assisted in the act vows not to participate in the stunt again. Blaine also performed this extremely dangerous trick in a special aired in 2010, and again before a live audience in 2015. Needless to say: Don’t try this at home, or anywhere else.